Lately, Pinterest seems to be everyone’s favorite social network. An increasing number of bloggers realize the tremendous potential that Pinterest marketing has for getting traffic to their blogs. What you may not know is that Pinterest is not a social media platform, in fact, it’s a search engine (just like Google). On Facebook, Twitter, Instagram and other channels, people go to check what their friends are up to and to chat with them. They have a social media intent so, even if they stumble upon a blog post or even a link to a Shopify store where products are displayed they aren’t looking to buy anything. On the other hand, Pinterest users have a buyer intent. They use keywords to search for products they want to check and buy. On holidays, like Christmas or Easter, people check their friends’ boards to find inspiration for gifts. Pinterest is a great social network for every niche not only for fashion, food or home decor fashion bloggers. Although these niches are more popular, you can find an audience on Pinterest for any niche. If you have a business where you sell offline or even digital products, you need to start using Pinterest marketing to increase the traffic to your website and grow your brand. Here are twenty strategies that you can start using right now. 1. Include keywords in your Pinterest username. When users are searching for those keywords, your profile will pop up in their search results. So for example, “Ana Smith – fashion designer” will be easier to find by people that are searching for fashion designers on Pinterest. In the same way, bloggers and companies that are searching for “expert roundups” or “influencer roundups” will find my profile because I used those keywords in my profile name. Attention, you should not stuff too many keywords in your username. Between 2 and 4 keywords are enough. 2. Add a suitable image to your profile. I recommend you to use the same photo on all your social channels and also on your blog and your guest posts. Being consistent with your brand image helps your reader perceive you as a familiar figure. 3. Include relevant keywords in your profile description. The ideal structure should be something like I am…( profession) I help… ( Targeted audience) to …( Desired result). 4. Include a call to action in your description profile. You could use something like join my free webinar or get my free ebook and add a shortened link there to your landing page. 5. Have at least 20 boards. All your boards should be related to your niche. Your first board should contain only your blog posts, on your second board, you can pin only your interviews or posts where you were featured as an expert. The following boards should be in different categories from your niche. For example, my first board is called “Minuca Elena’s Blog Posts.” Here you can find only posts from my site. My second board is entitled “Minuca’s Expert Roundups”. These are also only my posts, but there are roundups published on different sites from different niches. My next board contains only interviews about my blogging activity. After that, I have different boards “SEO Expert Roundups”, “Social Media Expert Roundups” “Blogging expert roundups” etc. All my boards are related to my niche, expert roundups. Only on my first board, I pin posts only from my site. On all the other boards I pin posts from other bloggers as well. 6. Delete or change the privacy settings to secret for the boards that aren’t related to your work. Your Pinterest boards should reflect your brand and expertise and not your hobbies. People will feel confuse if you write an entrepreneurial blog, and they see boards about cats or dessert recipes or makeup tutorials on your profile. 7. Give appropriate names to your boards using keywords. Don’t get fancy with the name of your boards by using titles that have no meaning to others. A board entitled “guest posts” will not attract people. Also, write the name of your boards in the language you blog. For example, if you are a German blogger that blogs in German then all your boards and your profile description should be in German. Using keywords in English will attract people that will be disappointed to see you blog in another language and won’t follow you. Remember: simply is better. Don’t get too creative naming your board with movie lines, Latin quotes or philosophical phrases. 8. Use keywords on your board description. As we said, Pinterest is a search engine, and if you use relevant keywords both in the name of the board and in its description, your boards will be shown to users when they are searching for that topic. 9. Make your blog Pinterest friendly. In each blog post, you should use images that are branded with your logo, the title of the post and the URL of your site. Your images should be vertical, like a portrait. The ideal size of a Pinterest friendly image should be 735 x 1102. Be careful, the ideal image sizes are not the same on all social media channels. Your perfect Pinterest image will not look alright on facebook or twitter, where horizontal images are preferred (the format that a landscape has). I recommend you use Social Warfare plugin. This is a plugin that allows you to set different images for each social network. Or you can set images for Facebook and Twitter using the Yoast plugin that is free. To make great images, you can use Photoshop or Canva (a free tool). Use the same colors that you have on your blog and include your logo. This way, if your followers see four different pins from your blog, before clicking on one of them, still when they will arrive on your blog they will feel familiar because they already saw those patterns on your other pins. 10. Use free photos that are related to the topic of your blog posts. For example, if your post is a review on a certain product you can make a photo of yourself using it. This will make your followers see you as more genuine. If the topic is more abstract, you can use free images that you can find on stock photos sites. My favorite is Pexels. Don’t use any image that you will find on Google because you may have big problems with copyrights. If you are using images from Google, filter the results to show you images you can use. You just have to click search tools-> more tools-> labeled for reuse. 11. Enable rich pins. These are pins that include extra information on the pin itself, as the name of your site and your icon displayed underneath the pin image. The user will see from who that pin comes. 12. Pin regularly. Both Pinterest, as a search engine, and your followers, need to see you as an active user, so you should pin between 50 up to 100 pins every day. You can use different tools to schedule your pins. 13. Engage with other people on Pinterest. Don’t be lonely here. This is not just a place to save the things you like and to promote your posts. You have the option of messaging other users, of liking and commenting on their pins. 14. Use keywords in the description of your pin. This way your pins will show up in the search results for those keywords. 15. Join group boards. If you use Pinterest marketing, even if you have a small following, you can still get your pins in front of a large audience by joining group board. You can use PinGroupie.com to find relevant board groups. You just have to include your keywords and select descending. This is how you can see boards with a lot of followers on top. If you have only 100 followers but you pin a pin on a board that is followed by 10k members than your pins will be seen be all those people. Each group board has its own rules. Generally, in the description of the board, you will find instruction on how to become a co-pinner. Usually, you have to send an email to the board owner with your info (your username and the email address that you use for Pinterest) or you can just leave a comment to a pin. 16. Don’t use hashtags. Hashtags aren’t a habit on Pinterest as they are on other social networks. Because Pinterest is a search engine, it’s easier for the user to find anything they would like without needing to add a hashtag. 17. Use Promoted Pins. Promoted pins are paid ads used by businesses owners that want to skyrocket their Pinterest marketing fast. They are based on a similar concept to Facebook and Twitter ads. Your pins will be seen by a larger audience than normal pins, and this will help you to raise awareness about your brand, attract traffic to your website and increase engagement. 18. Use Pinterest smart feeds algorithm. Pinterest’s algorithm is set to show the best pins first, that means that the pins that are most repinned, not the newest. When you pin a post for the first time, after you clicked save, click see it now, and then repin the same pin on multiple boards. This way, if you pin a pin on 6 boards (random number) your pin will have 6 pins (it’s funny how the word pin is a noun and also a verb). Don’t worry about duplicate content. Your followers will see your pin only once even if you pin it multiple times. Be careful, you can pin the same pin on different boards but not on the same board. If you do it, then you will have to delete the old pin. 19. Delete poor performing pins. Pinterest analysis the average number of repins your pins get. So, if you have old pins that were only pinned 2-3 times you should delete them. If your profile is new, keep them. 20. Check Pinterest Analytics. You need first to convert your personal profile to a business account, and you will have access to more data about your profile. You can see which are your most successful pins, how many people you reach and how many average views you get. There you have it. 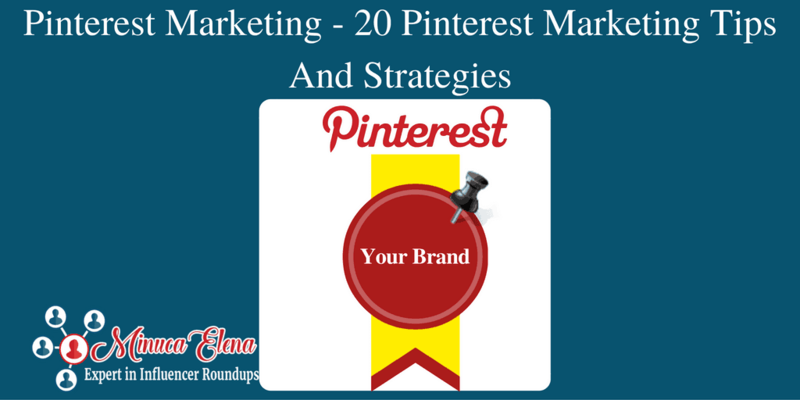 Twenty strategies that you can start implementing new to improve your Pinterest marketing. Let me know if you have any question by leaving a comment below. If you feel you learned something new today then pin this post and share it with your friends. Thank you! I really learned a lot. Thank you for posting this. I haven’t thought of Pinterest as a search engine, and this is a real revelation to me! Thanks for checking my post! Glad I could teach something new. Enjoyed this post, Minuca. Pinterest is my biggest traffic driver after organic search, so I enjoy learning anything new about it! Pinterest is an awesome source of traffic and is often ignored by bloggers that think that only crafts and DIY projects are popular on it. That is why I wanted to share these tips so anyone can see the valuable potential that Pinterest marketing has. I’ve really been putting Pinterest on the back burner, mostly because I feel like I don’t know enough about utilizing it. These tips were very helpful and inspiring me to optimize my Pinterest! TY! I am glad you like my post. Give Pinterest a chance. Though I have an account I never cared most of the points mentioned in the post. This is indeed a wonderful and informative guide for the users. Oh my! point # 5 is really amazing! 20 boards! That’s indeed a great idea. Presently I have only 6 boards only. Thanks Minuca for sharing such a lot of information. It’s nice to see you here again. You should give Pinterest a chance and I am sure you will get great results if you become an active user. I think bloggers are finally realising the importance of Pinterest, and the key consideration is as you’ve pointed out in your post … it’s a search engine, not a social network. Great content Minuca. If you’re interested in doing a guest article about how travel bloggers can use pinterest to raise the profile of their brand and image, just let me know. Pinterest is a wonderful source of traffic and people use it before taking decisions like where to travel, what to cook, what to buy etc. Travel is not my niche but thanks for your offer! Thank you for sharing this. I am just starting out with my new blog and wanted some tips for leveraging my Pinterest account to engage with readers. Your post was right on time! I am glad I could help you. Follow these tips and you will get a lot of traffic from Pinterest. However, I have an old Pinterest account for a site I no longer am pursuing. Should I recreate a new Pinterest account for my new niche site or use the old account but change profile name, etc..? I think it depends on your niche. If your old site was in a completely different area from the new one, then it doesn’t make any post to keep it. For example, if your old site was about cooking and your new one is about cars, then it will drive away your old followers and confuse the new ones. If the niches are related and you already have a following on that account, then you can keep it. Just change your bio and make new boards. Some of the old followers may unfollow you but at least you don’t have to start from zero. 1 question – would you pin (posts/articles) directly from your blog to Pinterest? meaning by using the PIN button while you’re at your site? 1. Schedule the post to be pinned automatically. You can do it with different scheduling tools. Most of them are paid. A free tool is IFTTT (If this then that). You can connect your Pinterest account to your site and it will automatically pin your post when you publish a new post. 2. Pin it yourself by hovering over the image or clicking the sharing button of your plugin. This is what I do. You can pin the same pin to different boards and the pin count will increase. This doesn’t happen if you schedule to be pinned automatically. This was really helpeful and just what I needed thank you! Pinterest is one of the leading social media platforms and no doubt that people are engaging more with the pins. Though I am not a regular user but still I know that the consistency is the key. It’s important to pin daily. I like the idea of putting the keyword in the username. I am glad you like my post. Thanks for sharing your feedback with me! Thanks for sharing. I’m on Pinterest for long time ago, but didn’t much traffic from that platform. Mostly I see women bloggers get thousand of repin for their posts. Yeah. I heard those bloggers said we should keep active on the platform. However, it’s a bit difficult to keep repin 50 to 100 images every day. Could please share me what tool you’re currently using and how to manage your time on pinterest? To gain traffic from Pinterest you must be very active and pin quality content from your niche. Your followers must see you as a curator. BoardBuster is a very popular scheduling tool for Pinterest. A free option although kinda tricky is IFTTT. You can set it to automate your social media posts. For example, I set it that whenever I pin something it also automatically tweets that post. Thanks for checking my post! See you around. Do you have much experience with promoted pins? Do you think they perform better (or worse) that sponsored tweets or Facebook adverts? I’m going to be doing some marketing in the next couple of months but don’t want to throw my money at a platform if the engagement is super ineffective. The lifespan of a tweet is half an hour, for a Facebook ad a few hours, for pins is the other way around. Old pins perform much better than new ones. Because of the smart feed algorithm, an aged pin can bring traffic for a long time because as time passes and it gets more repins and likes, Pinterest pushes up in its search results. Thank you so much for these tips! I’m always looking to build my Pinterest account. Good luck, Amber! I am sure you will have great results! Great tips! I just recently started using Pinterest for my blog/business, so I will keep these in mind as I learn the ropes! Really great content and very useful information. Guess I have some work to do! I’ve been playing with Boardbooster. I think it will save me lots of headaches. Thanks for the tips! Boardbooster is a great tool for scheduling pins. You should also try IFTTT (if that then that). It’s free and it allows you to set custom recipes, like whenever you publish a new post to share it automatically on all your social channels. Also, you can set that whenever you pin something, it also tweets that post. You just have to set it and forget about it. I just recently started growing my pinterest account and so far, the growth has been really slow. It can be kinda difficult in the beginning until you get your first 1k followers then it will grow much faster. Thank you for this, it is very interesting. As someone whose blog/pinterest is about hobbies mine of course is full of hobby posts. I find with my particular niche it is very hard to get pins to be seen as there are so many pins occuring from so many sources that are huge in the industry, those who already had plenty of followers are the pins that Pinterest shares with people. Do you blog about hobbies in general or about a specific hobby? You should optimise your boards and all of your pins with relevant keywords so they will show in search results when someone searches for those hobbies. Your targeted keyword shouldn’t be “hobby”, because is too broad. Optimise each post for that specific activity. Also, pin in group boards that have a lot of followers. It will take more time, but you will get there. A faster option is promoted pins. Great, solid tips! And very concisely written — I love that. Thank you for sharing! Glad to hear that, Crystal. Thanks for this great post! I’m recently taking my Pinterest marketing more seriously and it has shown some improvement in numbers. Happy to hear that. Let me know what changes you will see after implementing these techniques. Lots of great info here, Minuca! Thank you so much for sharing! Great read! Time to start pinning! Thanks for the awesome tips! I’m going to clean up my Pinterest account tomorrow! Pinning! This is very helpful. I followed everyone of the steps. Glad to hear that, Idriss! These are such great tips! I only recently started paying attention to my Pinterest account, and have so much work to do! You can use a tool to schedule your pins and you will save a lot of time. These are all really great tips. It’s exactly what I did/am doing to grow my Pinterest! Sharing this article with blogger friends! Thank you, Christine! Keep up the good work. Thanks, Janalyn! I am sure you will get a lot of traffic from Pinterest is you follow all these tips. Great tips! I have to clean up my Pinterest page! Pinterest is an amazing tool for marketing especially if you’re in the beauty and fashion industry. There are plenty of ways to use it to your advantage! I am really loving your tips! Yes, fashion and beauty are very popular topics, but you can build an audience on Pinterest in every niche. Great tips! I didn’t think of Pinterest as a search engine. Your post is very helpful. Thanks for sharing. This is one of the biggest myths about Pinterest. Check my next post where I debunk all the fake ideas people have about Pinterest. There’s no denying how awesome pinterest is! It’s perfect for gaining audience and traffic towards your blog. It’s important to learn how to utilize it though, so you can use it to your advantage. You are totally right, Carol. I think that many bloggers underestimate the potential that Pinterest has. It’s a great tool for getting traffic to your site. Thanks for your feedback, Jennifer! I am glad you find this post useful. Pinterest is HUGE now! This is great information! When you pointed out that Pinterest is actually a search engine, not social media, that helped me make more sense of this platform. I still have a lot to learn. 🙂 Why do so many people refer to Pinterest as “social media” if it really is not? Like Philip Ariel said, I guess I need a few more boards. I think I have 15 or so….I am still scratching my head about Pinterest and I hope you will do more on this…perhaps a video series? 🙂 That could be really helpful. Really helpful article. I am saving it to refer back to it any time soon as I am still learning how to properly utilise Pinterest for my blog. Thanks, Ninz! Keep following this blog and you will have a great place where you can learn how to get the best results from Pinterest. Group boards have really helped me to drive more content to my Pinterest. I didn’t get serious with it until September but I grew from 25 followers to 120 within a five week time span. Baby steps, but progress is progress! That’s a great result. It can take a while until you get your first 1k followers but after that, you will see a very fast growth. Keep pinning consistently and join group boards that have a lot of followers. It’s better to be on a few boards that have over 15k followers than to be in 30 boards that have only 1,000 followers. We love Pinterest. It is so helpful especially in blogging. I always wanted to use Pinterest in order to get more views on my blog, but I never knew how so this post is extremely helpful for me. I’ll attempt to follow your tips and hopefully, have some luck. 50 to 100 times a day? I’m thinking the pin tools like Tailwind and Board booster are effective in doing this. Seeing Pinterest as a search engine instead of a social network changes the game for business. Is it possible for a Dentist to use Pinterest to market his local business? The basics of SEO can also be seen here in a lot of ways. The key word is..well, key word. Visualize and imagine yourself as the customer, and if you know how search engines work, you’ll know how to be found. Great read, a lot I’ve learned. Such a great post! I’ll be sure to keep this in mind whilst I’m trying to go my Pinterest! Really a great post. I will keep these things in mind, while using Pinterest. Again, thanks a lot. Just when I thought Pinterest was for crafters. Thanks, Minuca! There are a lot of fake beliefs about Pinterest. One of the most common is that Pinterest is only for DIY bloggers. You should check my post about the Pinterest myths you should avoid. Hi Minuca, great article. I’ve been hearing a lot about Pinterest lately, so this was spot on! 20 valuable advice for beginners like me, well explained and easy to do. I enjoyed it a lot, keep up the good work Minuca! Great marketing advice for Pinterest. I get over 500k views a month with my current username. If I change my username, will I lose my followers or end up with a ton of broken pin links? Or does it automatically 301 redirect to new username and url?